After deciding to stay in Taiwan for a while, The Boyfriend and I thought it was time for us to take the next step in our relationship. (Don’t book the church and caterers just yet, Mom, I’m not talking about that step.) We decided that we were ready to get a dog. We both love dogs, and were crushed when The Landlord informed us that we “can’t have K-9s or kitties in the apartment.” We’ve been so excited to bring a little furry friend into our lives, and now we will have to wait until we move into another apartment one day. This little lady in the photo is Violet. 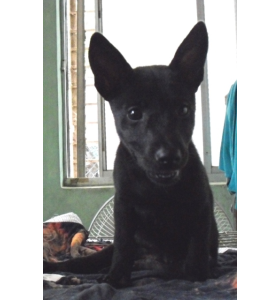 I found her on the AnimalsTaiwan website, which is one of the many shelters in Taiwan for stray animals. Violet is one of the thousands of dogs in Taiwan that doesn’t have a home, and because I can't give her a home myself, I’m going to be sponsoring her for the next year. That means that I will send the shelter money every month, which they will use to buy her food, pay her medical bills and use for anything else she might need. I can also go to the shelter to play with her. I can’t believe I haven’t thought about doing this sooner as I've always had this need to help out in some way. And for only 500nt (about $15) a month, I can help make a difference in this little angel's life. I know it’s only a drop in the bucket, but I believe it’s better to do something than do nothing. If you are inspired by this, visit some of your local shelters or find one online, and sponsor a dog for a year. You'll feel good for doing good. I know for a fact this money will mean more to this animal than what those two Starbucks coffees, which I will be giving up every month for a year, means to me.